Father Raymond Baumhart with President Medallion recipients at the 1980 Founders' Day. 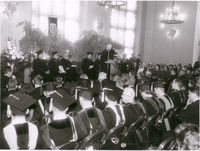 The 1960 Founders' Day Convocation. The Founders' Day Convocation in 1960.